I am Phil Walker-Harding and I live in Sydney, Australia. I have been designing games for almost 10 years now, although most of that time I was doing it very casually and self-publishing my designs. The last couple of years I have been working more seriously at it. I also grew up playing board games, and often made my own way back then too! I studied film at university and have recently completed my Masters of Theology. Of course, it greatly depends on the situation and group! I play a lot of shorter causal games, and in that category I really enjoy For Sale, Coloretto and Blokus. In terms of social games for larger groups I really like One Night Ultimate Werewolf and Codenames. My favourite more complex strategy games are Race for the Galaxy and Tigris and Euphrates. I often play For Sale with people who are new to gaming. I find that the rules are easy to pick up, yet the structure of the game is very clever and interesting compared with many known mass-market games. I have also seen Carcassonne, TransAmerica, Cartagena and Cloud 9 go over well many times. I think the first time I ever played The Settlers of Catan would have to be up there. Catan presents so many things that are great about modern board games: social interaction, streamlined rules, planning ahead, little downtime, and the sense that you are creating something as you play. Being introduced to all of this quite suddenly broadened my perspective about what a board game could be. I should also mention the few times I have played a dozen or so games of One Night Ultimate Werewolf in a row. Sessions like this can create all sorts of surprises, laughter and memories. Board games have an amazing way of bringing people together for a shared social experience. So for me, seeing a group of different ages and backgrounds come together around a game is the most important thing. It is fascinating to me that just a few cardboard components and a set of rules can have this effect, and I think this is what makes our hobby unique and important. I think I have a very strong drive to create in general, and board games are a challenging, exciting and fulfilling thing to make! I feel we are in something of a golden age of game design, which probably can’t be said for many other creative fields, so it is very rewarding to be a part of it. I also hope to bring some small amount of joy into the lives of other people, and designing games that are accessible and fun is one way I can do that. That’s a tough one. I feel like I managed to capture something special in Sushi Go! – at least that is the game of mine that seems to have hit a chord with the most people. My aim with that design was to distill the “pick and pass” drafting mechanism down to its core, and I think Sushi Go! showcases how fun that structure can be. 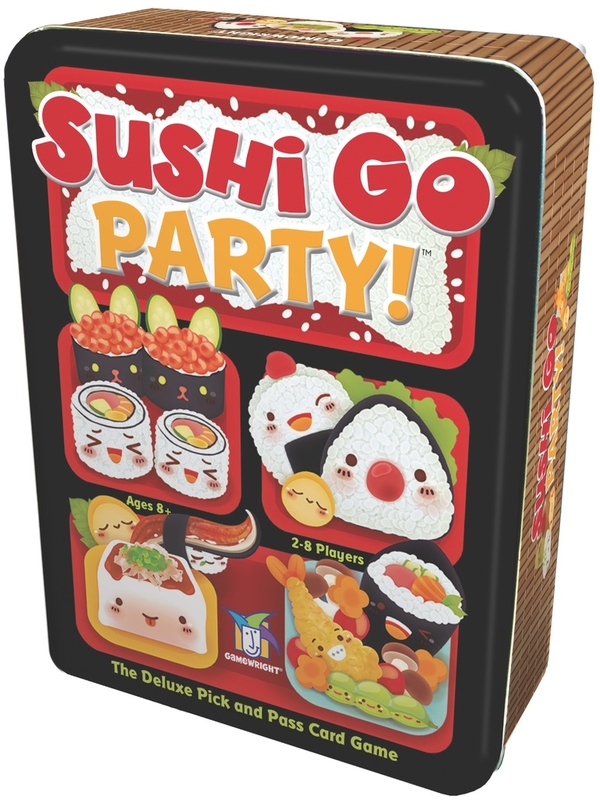 More recently, I completed its sequel, Sushi Go Party!, which has so many new cards it ended up feeling like I was designing a whole encyclopaedia of scoring rules! So getting that game complete and working all together felt like something of an accomplishment. The most important part of the process for me is recognising the dynamic which generates the most fun for the players and then honing the gameplay so that it is brought to the fore. Creating a game that “works” isn’t so difficult. Creating a game that has that special “fun factor” is what’s tough, and it is also quite elusive. Often this means taking out parts of the game that I have spent a lot of time on to ensure that the best part of the design is what is in focus. This area is where most of my time seems to be spent. These days it is usually the mechanism that comes first for me. I try to find some core element of gameplay that is inherently enjoyable and creates interesting interactions between the players. Quite quickly though, I want to find a theme that works with it and use this to inform the rest of the design. Especially when designing quite simple games, as I usually do, a theme alone will rarely suggest a game’s core mechanism, and this for me is the first big task of designing. Of course, theme remains very important and should mesh well with the game’s rules. In terms of mechanisms, I often get ideas from playing games or watching others play. I look for moments that seem to be generating a lot of fun, surprise or tension in the players. Often these moments suggest ideas for a good mechanism to explore. Sometimes I also give myself little design challenges to help get me thinking. Often these have to do with streamlining a particular type of game or mechanism down to its most basic form. This is something I find really interesting and rewarding to try and do. In terms of looking for themes, I often just gravitate towards my favourite things, as obvious as that sounds. For example, it is not hard to tell from my games that I like sushi and Indiana Jones!